P A T R I Æ /ˈpa‧trēī / [Latin] Fatherlands, homelands. Related: generation, ancestry, descent, tribe, family, natural habitat. P A T R I Æ is a collection of antique homespun, handwoven hemp and linen textiles, and original goods crafted from them, sourced in founder Barbara Pisch’s homeland in Central and Eastern Europe. Woven between the early-19th and mid-20th centuries, these durable organic textiles are rich with individual stories of family-based village farming, indigenous heritage crafts, and traditional women’s work. Historically, each family in this region harvested their own hemp and flax, spun them into threads, then wove them into fabrics that were hand-sewn into clothes and other items such as towels, tablecloths, pillows, bedding, grain sacks, and wagon covers. The original goods in the P A T R I Æ collection are designed to highlight the character of each fabric, and continue in the tradition of local production, handcraft, and utilitarian design. Worn grain sacks, sheets, and other historic items are re-purposed into functional pieces including tote bags, pouches, tops, and runners, each handmade in-house at the P A T R I Æ studio in Asbury Park, NJ. The guiding principles and aesthetics behind P A T R I Æ are informed by founder Barbara Pisch's own history. 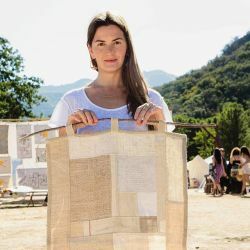 Born in Slovakia, she relocated with her family to the US as a child and started returning to her homeland as a teenager, where she began collecting antiques as a way of connecting to her heritage. Her collecting quickly began to focus on antique hemp and linen textiles, which would eventually become the staple of the P A T R I Æ brand. Barbara grew up on the Jersey shore, then spent years in NYC working in various design industries and galleries, acquiring a graduate degree in the history of decorative arts, and honing her eye, before returning to her beloved beach and family at the Jersey shore and opening the P A T R I Æ store and studio in 2016.